Being fully programmable and with costs continually decreasing for more functionality and capacity, robots can provide significant ROI in manufacturing operations. Robots are ideal for repetitive operations and can significantly improve manufacturing productivity and capacity as well as the health and safety of workers. Traditional 6 axis robots have one limitation however, they are usually mounted in a fixed position, such as being bolted to the floor or mounted on a pedestal. This limits their reach and potential orientation to an operation and therefore limits their application. Adding a 7th axis to a traditional 6 axis robot can provide significant opportunities to increase a robots utility and productivity. The 7th axis of movement is provided by a Robot Transfer Unit, also called a Linear Motion Track, Robot Positioning Track, Robot Slide or Robot Transfer Shuttle. 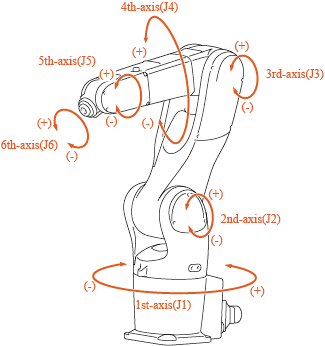 The system is often called a '7 Axis Robot' system or '7th Axis Robot'. Adding an extra axis to a robots functionality extends the envelope of work of the robot, meaning that it can now operate along a workpiece for machining long grooves or adding pinstriping. The robot can now operate between multiple workstations, advancing a workpiece or transporting tools to multiple machines. Parts can be moved along machining and inspection centers to advance production processes. Adding a strict linear motion means that the robot now has the ability to move a part without changing the part's orientation. In addition to tending multiple machines, 7 axis robots are used for picking pallets or other warehousing tasks. Adding reach to a 6 axis robot enables smaller, less expensive robots to handle tasks which previously required larger robots with more reach. 7 axis robots are used across the automotive, aerospace, packaging, solar/wind, medical, consumer goods industries, and more. Robot Transfer Units (RTUs) enhance operations such as drilling and routing, composite layup, welding, trimming, fastening and assembly, painting and coating. 7 axis robots extend warehousing operations such as loading and unloading, palletizing, product picking and moving products to and between production lines. Adding the seventh axis to a robot enables a single robot to perform multiple functions along an assembly line. The robot is positioned for each operation with a single carrier piece instead of requiring several robots to be positioned along the line, saving considerable capital expenditures. Users can choose from a floor-mounted, elevated (gantry) or inverted configuration. 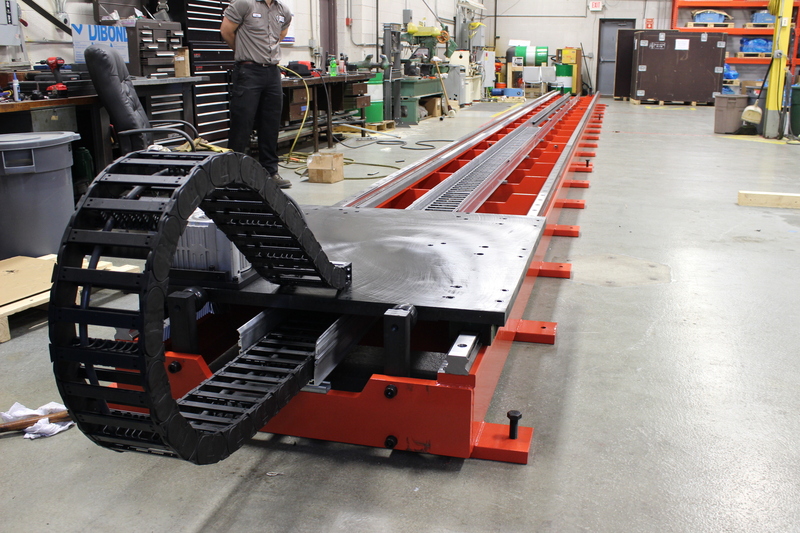 An elevated Robot Transfer Unit (RTU) moves the rail system vertically off of the floor. This could mean that it is at a height needed to fully access machine tool doorways or it could be elevated well above operations along a high rail much like a gantry crane. Inverted RTUs place the robot upside down on an elevated rail system, enabling the robots to reach down. Elevating robot transfer units for overhead operations saves floor space for more compact machine placement. It also enables moving working materials and pallets closer to the area for faster production rates, enabling worker freedom of view and movement and improving access to all machinery by maintenance personnel. Companies installing robots on 7th axis robot transfer units have sped up production, decreased the need for additional floor space and reduced the amount of time required to provide return on investment for each robot. Another advantage to seventh axis robotic slides is that more than one robotic arm can be placed on the same slide for additional productivity and flexibility. When adding a 7th axis to your robot system, you now have to consider the cycle loads on the robot and any actuators and effectors. Adding mobility to a robot usually means that the duty cycles are going to increase. Will the system be running 24/7 or for a few hours a day? Is the lifetime of the system a few years or 10 or 20 years? A well-designed robot linear transfer unit will meet and exceed the duty life of the robot itself. Linear Transfer Units need to be designed for their operating environment. In a machining setting with metal chips or in environments that have grease, cutting oils or other liquids, the transfer unit will need the right protection to ensure it meets its design life. Managing liquids, shavings, dust, swarf, contaminants and corrosives can be important design factors. Maintenance needs to be quantified and managed. Self-lubricating systems extend operating cycles between lubrication and maintenance and can pay for themselves. Cable design is important as cables have a flexure rating that is dependent upon the bend radius and the number of cycles. Poorly designed cables can mean decreased cycles between replacement. Industrial robots can impart significant force, enough to cause injury or damage. Adding additional robot movements along a linear transfer unit means that additional safety considerations are necessary. Fencing, curtains or other barriers are often required to isolate workers from rapidly shuttling robots. Stop switches and mechanical stops can prevent robots from running off the ends of tracks. A significant challenge in onboarding a robot transfer unit is programming them to synchronize with the robots they carry. Working with an experienced design partner can ensure that you are capable of programming and operating the completed system. Because they are integrated with multiple operations, robot transfer units provide operating ‘leverage’. They can make an entire system of machines, operators and workers far more efficient, however when they fail or require maintenance this means that the entire downtime cost of the system is now in play. This means that selecting the right vendor partner is critical to ensuring maximum ROI. LazerArc uses a combination of zero backlash cam systems with low backlash gear heads to achieve high accuracy and repeatability on all systems. LazerArc positioning systems are not catalogued items but customer-specified assemblies designed to fit your application. They are capable of fitting into your automated robotic systems and units can be adapted to your specific servo motor or robot brand to expand manufacturing capabilities. Are you considering a Robot Transfer Unit? Get the Lazerarc Robot Transfer Unit Capabiliites Guide to help you to understand RTU capabilities and the types of questions that you should be asking to get the right solution for your application.